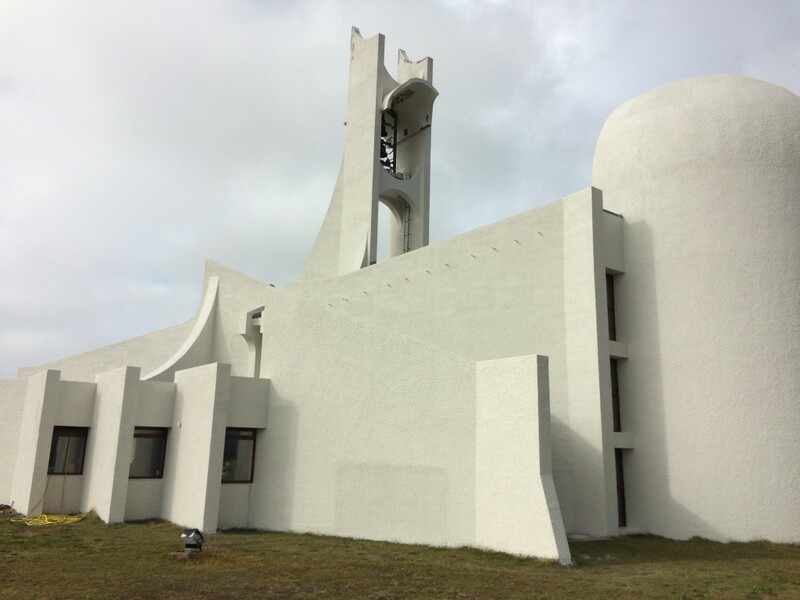 Architecture in Iceland offers several puzzles. For one, where are all the old buildings? When a country boasts a thousand years of history, you’d expect to find a few old stone churches or at least a solidly built public building less recent than the twentieth century. But that’s not Iceland. This could be due to the building material of choice–wood–which obviously doesn’t have the longevity of stone in any climate. Maybe the island’s volcanic activity over the centuries has caused the dearth of old structures. Or perhaps it was the poverty of Iceland’s farming citizens before expanded trade and tourism transformed the economy. However it happened, a twenty-first century country in which nearly every building seems to be new and well-maintained is an interesting phenomenon. A lack of old buildings, however, doesn’t mean there isn’t plenty of architecture to admire. There is. 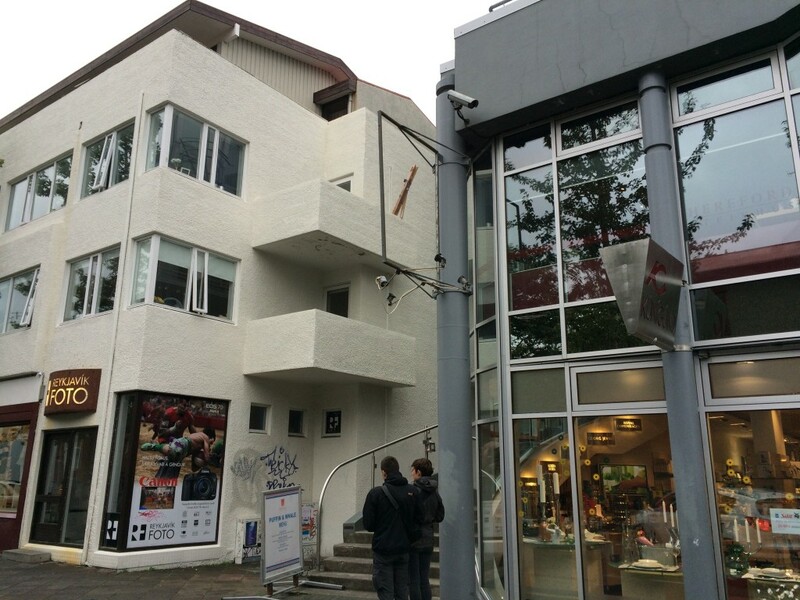 The buildings in Iceland tend to be blocky and even single-family dwellings are usually multi-storied. The red house [R] was situated directly across from our B&B in Reykjavik. I’d open the blinds in the morning to be greeted by this vibrant color, despite a pale sun. I particularly noticed a plethora of windows, which would be desirable for letting in whatever light the winter sun could give. Since heat is cheap due to thermal resources (see my blog “Why Do Icelanders . . . ?”), then constructions with a lot of windows makes sense. 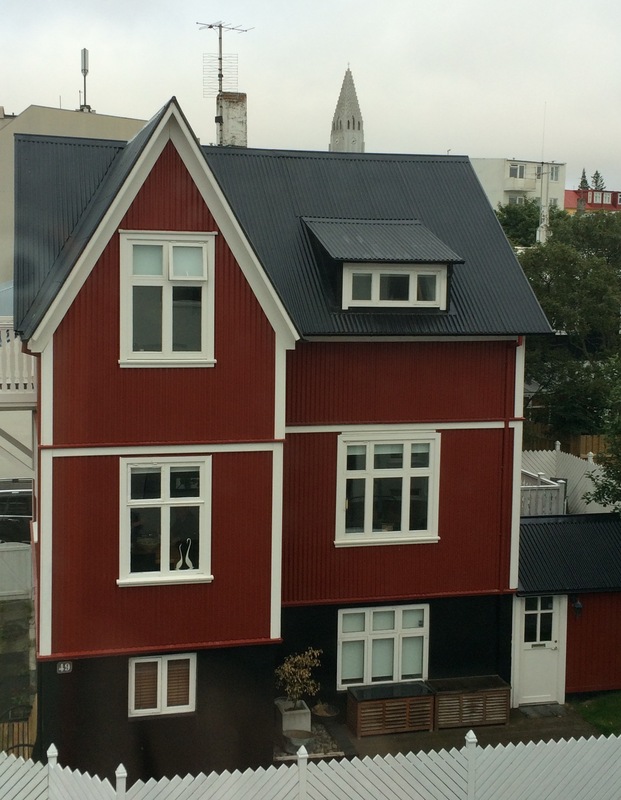 These lovely homes [below] in Reykjavik seemed to set the tone of the entire city for us. 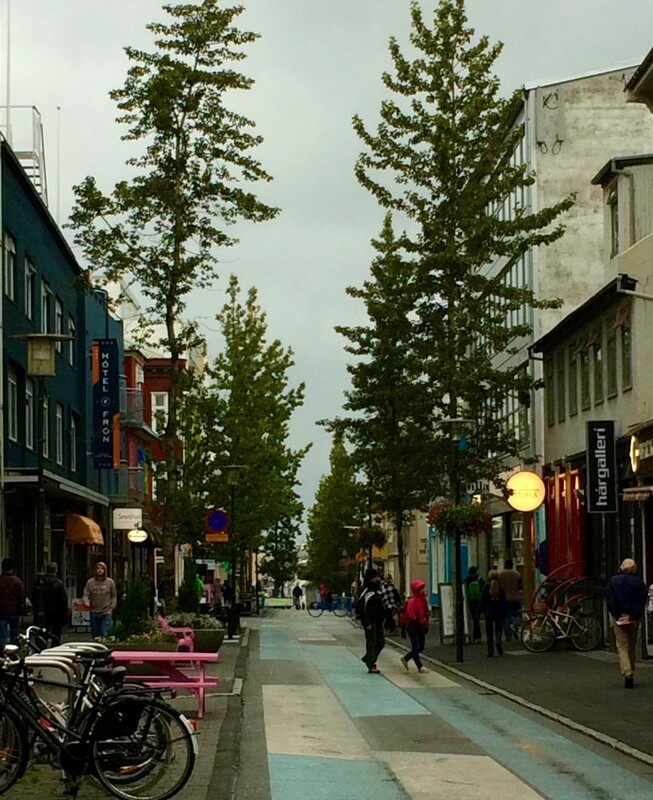 And I loved this street [below] in Reykjavik’s shopping district with its trees and bicycles. To the right and left as you stroll along, you’ll see commercial buildings with squared shapes and multiple windows like the domestic architecture. This aerial view [below] of the buildings fronting the harbor shows the clean lines and fresh paint of the city structures. It was taken from the tower of Hallgrimskirkja (Hallgrim’s Church), the tallest building in Reykjavik. 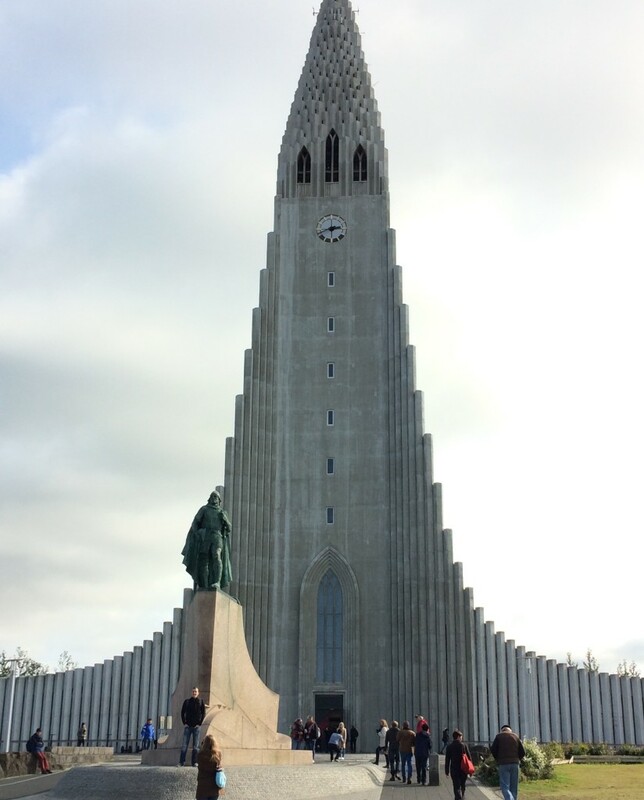 To my eyes, Hallgrimskirkja is not only striking and unusual, but also stately and beautiful. 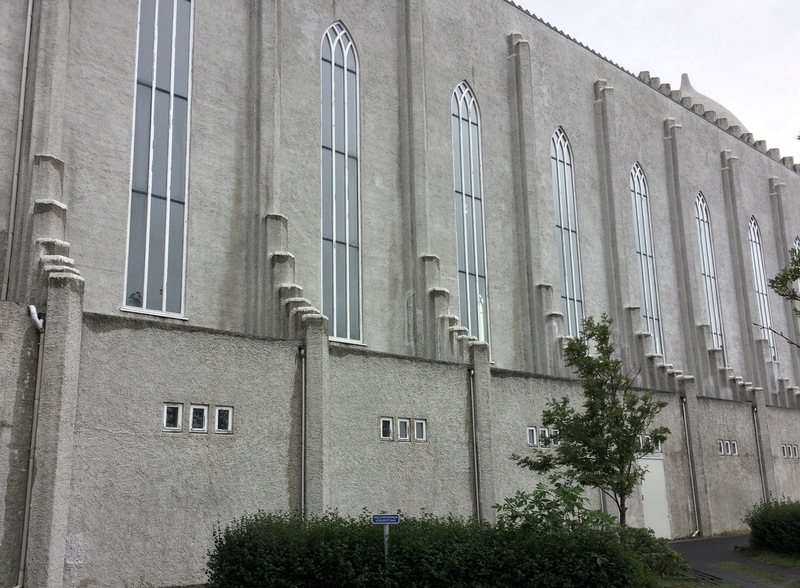 If you assume that a church in an old European country should involve flying buttresses and gargoyles, you’ll have to rethink your expectations in Iceland. 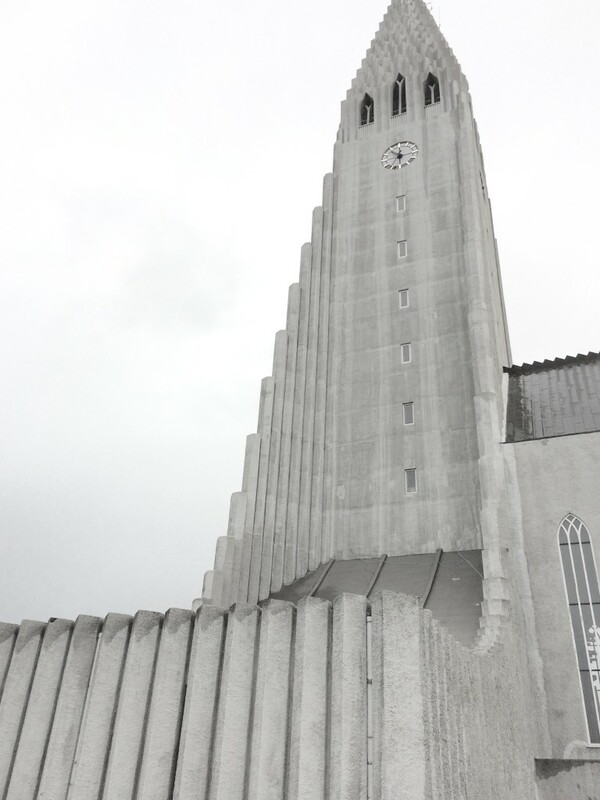 Reykjavik’s Halgrimskirkja is high and sweeping, white and new. But it does have a kind of flying buttress [below] which give natural light as well as privacy to a series of administrative offices located along the sides of the cathedral. 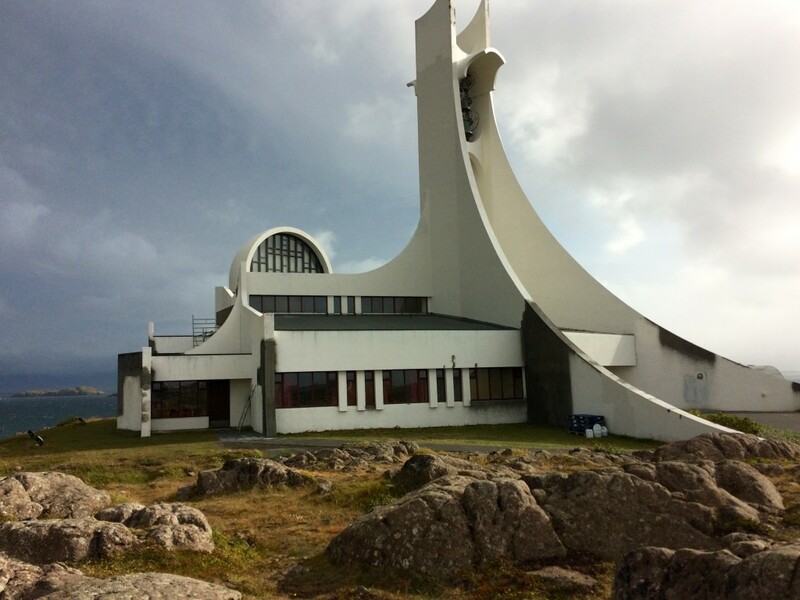 The modernist churches scattered throughout the country embody some of the most exciting architecture to be found in this little country. As we drove around, we’d happen on them like little delights. 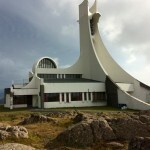 Truly they are churches like none other. 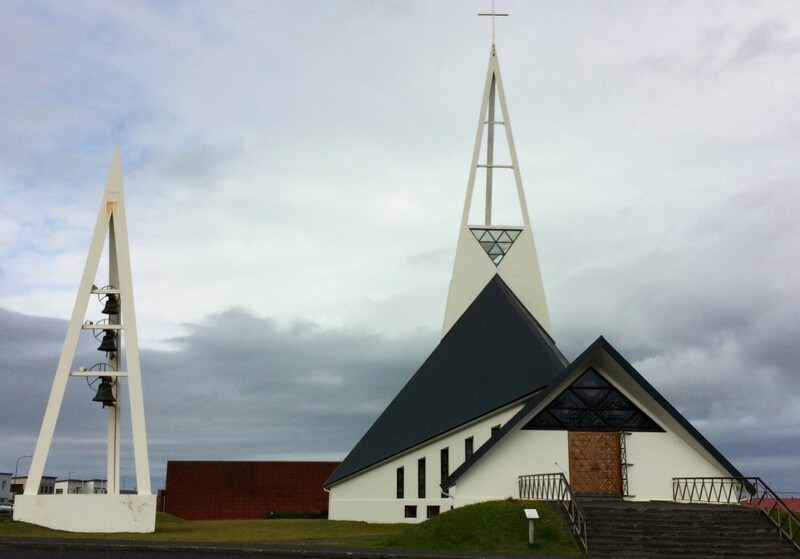 There’s a wind-swept, aerial-born feeling to this church near Grundarfjoerdur, as though it connects to ships that sail between sea and sky. 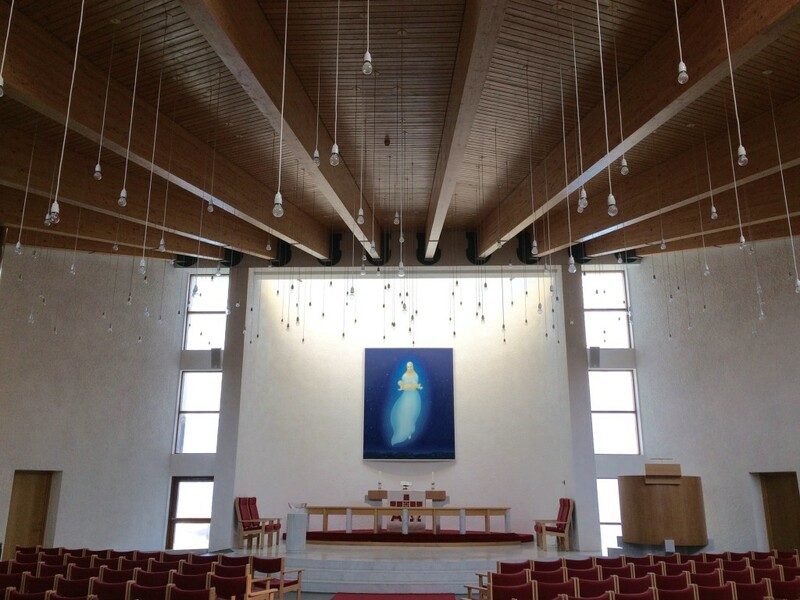 The interior lighting seems to drip from above, against clean white walls and fresh wooden beams. 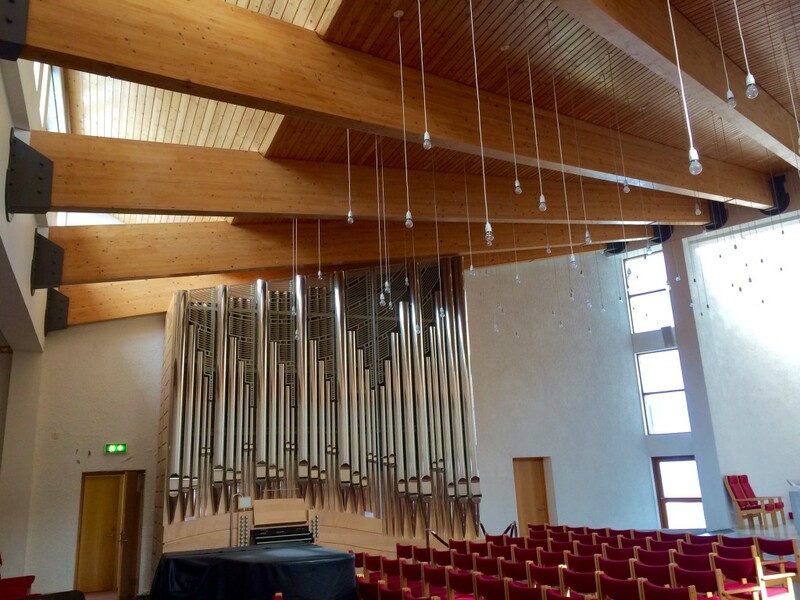 Surely the organs that inhabit these churches must have unique characteristics beyond their contribution to the architectural design. Not getting to hear any of them being played was a real disappointment. 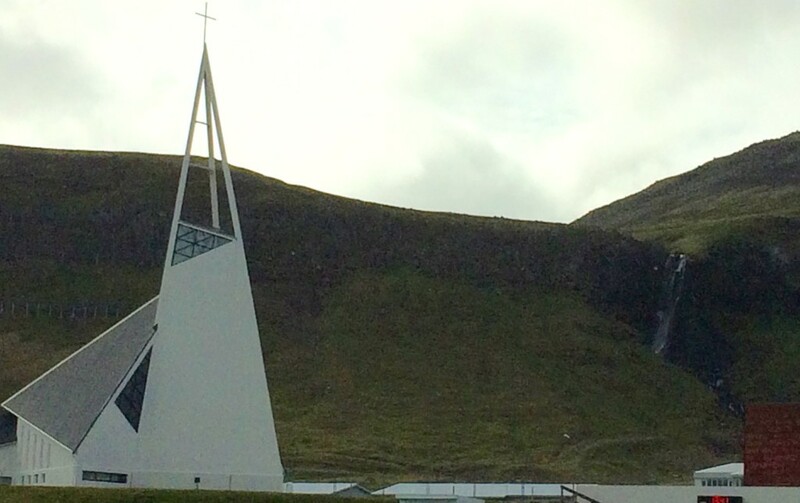 I wish I knew the name of this church [below] that we happened upon while driving the north rim road on the Snaefellsnes Peninsula. If you, dear reader, know its real name, please tell me. In the photo of the church [R], taken from another angle, I tried to capture the drama of the white tower against a dark wall of black lava rock and greenery with the punctuation of the white waterfall in the distance. But sadly the lowering light obscured what I saw. I’m including the photo here in the hope that you can visualize it in your mind’s eye. More traditional churches dot the landscape. Quite often they are ancient wooden one-room structures that sometimes have turf roofs, always suggesting they are about to meld back into the land. 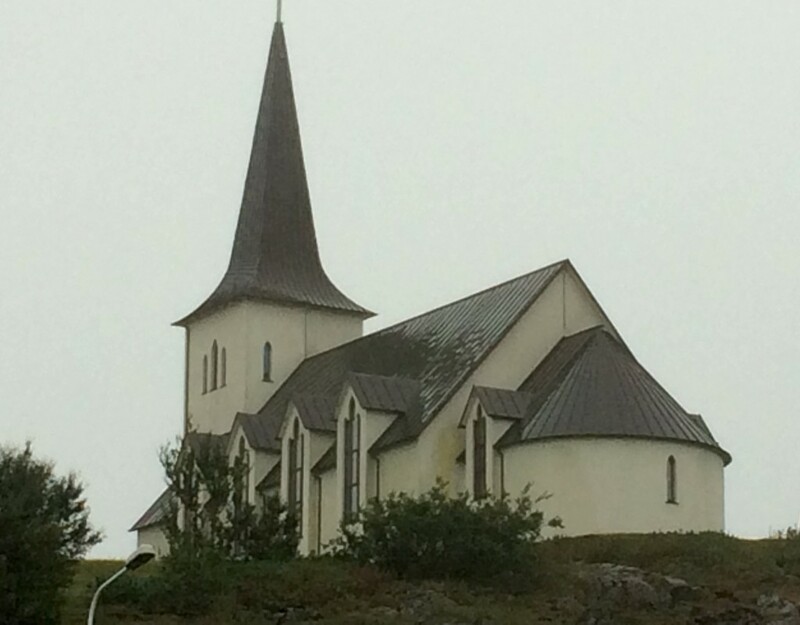 This was not the case with the lovely church at Thingvellir [L], with its black slate roof contrasting with the white exterior walls. You can just see the edge of the rocky ramparts of the environs where the world’s first democratic parliament was held back in 930 C.E. We could see the church [R] just past the beautiful waterfall of Gluggafoss. In order to reach it, we had to drive through a farmer’s yard and up the hill beyond on a narrow country road, winding and rutted. You can see from the scaffolding on the left side of the door that it had just been painted. 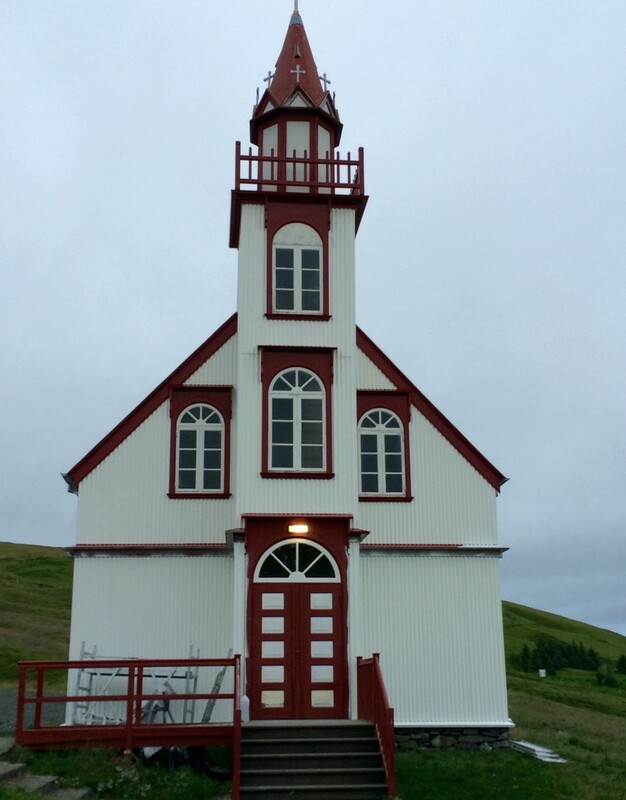 There were many of these little wooden churches in back yards and underneath looming hills throughout rural Iceland. I wonder if they are each treasured by a local congregation, or if they are preserved by the state for historical and aesthetic purposes. 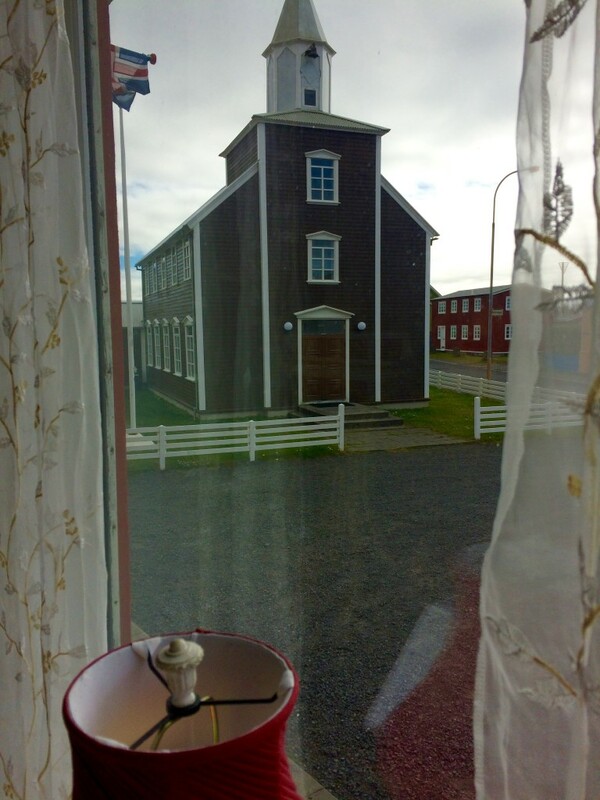 The church at Eyrarbakki graced our lunch at the Red House restaurant, as you can see from the interior shot [R]. 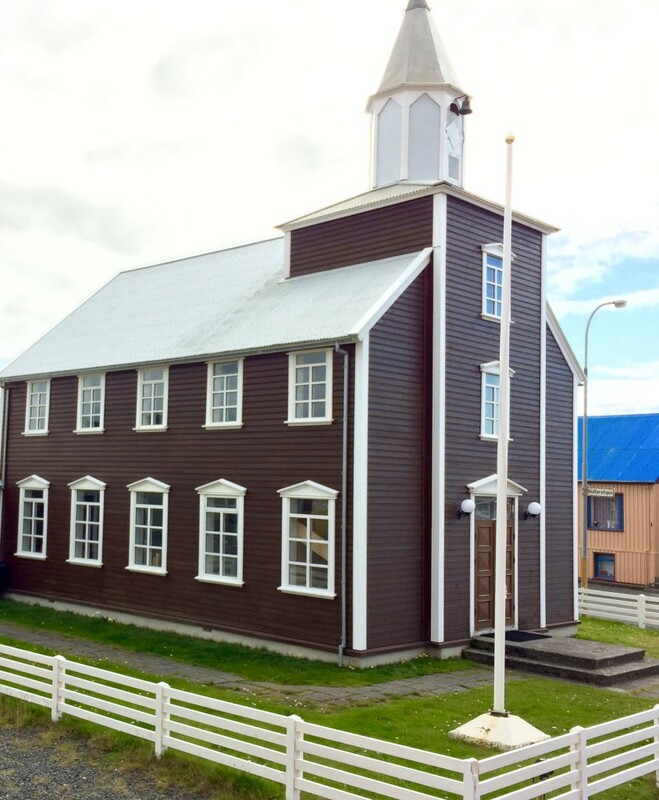 I’m curious to see up close some of the few remaining sod churches, like the Saurbaer church of North Iceland, but it didn’t happen this trip. I had also hoped to see Keldur, the medieval farm west of Hvolsvollur, an ancient site barely rescued from age and gravity. The guide books warn tourists that the National Museum Trust imposes a limited and strangely variable schedule, almost as if they’re daring visitors to actually catch them open. We didn’t, alas. Maybe on some future return trip.